Indiana State University President Dan Bradley has recognized ISU students Matthew Huckleby and J.D. Miller with the 2010 President's Award for Civic and Community Leadership. The award is presented annually to a junior or senior who has made community service an integral part of their university experience. Bradley presented the awards Tuesday during the university's annual Community Engagement Recognition Banquet in Hulman Memorial Student Union.Huckleby, a junior from Georgetown majoring in political science and economics, is the student member of the ISU Board of Trustees. Miller, an elementary and special education major from Reelsville, died Dec. 26 after battling cancer and was recognized posthumously. "Matt Huckleby has continued the commitment to community service he began as a Boy Scout working to earn the level of Eagle Scout. At Indiana State, his impact has been quite significant and his experiences have been ranged from serving as a member of the Board of Trustees to lending assistance to Katrina victims. I am confident that following graduation, Matt will continue to seek ways in which he can serve others and make a difference in his community," Bradley said. Huckleby has also been active in the Student Government Association, College Republicans, and two service learning trips with the Jane Addams Hull House Association. As a student worker in the Center for Public Service and Community Engagement, he coordinated the Donaghy Day service project and volunteered as a learning community peer assistant with the Freshman Class Legacy service learning project. Indiana State previously recognized Huckleby as Student Leader of the Year in 2009." J.D. Miller served as an inspiration and a role model - not only for students but for all of us at ISU," Bradley said. "His positive attitude and hard work helped inspire students, staff and faculty members to become more involved in community service initiatives. During his all too brief time with us, J.D. helped Indiana State make an impact on the various agencies, especially those working to fight cancer." Miller's activities included the American Cancer Society Relay for Life steering committee, St. Jude Children's Research Hospital's "Up 'Til Dawn" executive board, Indiana Student Educators Association and Lutheran Campus Ministries. He also worked as a resident assistant in campus residence halls. Miller previously received a Distinguished Hoosier Award from Gov. Mitch Daniels, a 2009 Danny Thomas Leadership Scholarship from St. Jude Children's Hospital and was honored by the ISU Alumni Association. Shortly before his death, Miller was awarded his diploma from the Bayh College of Education and achieved his dream of becoming a teacher. Also during Tuesday's Recognition Banquet, St. Mary-of-the-Woods College received the university's Community Partner Award. Outstanding Service Awards were presented to ISU Facilities Management and to Patricia Weaver. Candace Florence was recognized as the Outstanding AmeriCorps Member and Amanda Parkins of the 14th and Chestnut Community Center received the Outstanding AmeriCorps Site Supervisor Award. 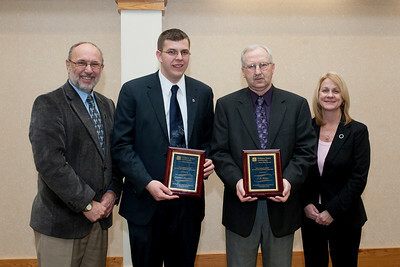 Photo: http://isuphoto.smugmug.com/Events/CPSCEAwards/DSC0396CPSCEAwards/801587909_5uX7e-L.jpg - Indiana State University President Dan Bradley (left) presented the President's Award for Civic and Community Leadership to student Matt Huckleby and, Jeff Miller and Jean Miller, on behalf of their late son, J.D. Miller. The Center for Public Service and Community Engagement conducted its annual community engagement recognition banquet, with awards going to students, staff and community members.